Over the years I have tried to come up with simple ways to add a personal touch to my packages. There are so may sources out there for gorgeous gift tags and wrapping paper. However, they can be costly an sometimes a little impersonal. Here are a couple of ideas that are fun for your kids, that won’t break the bank and that will make your packages extra special! Consider making gift tags out of your children’s artwork. They are so easy to make and bring so much pride and joy to your little artist! I made these years ago and they still bring a smile to my face. All you need is a couple of drawings, card stock, a printer, scissors, hole punch and some ribbon. Copy the artwork on card stock or photo paper. These are so fun to use on colorful packages. 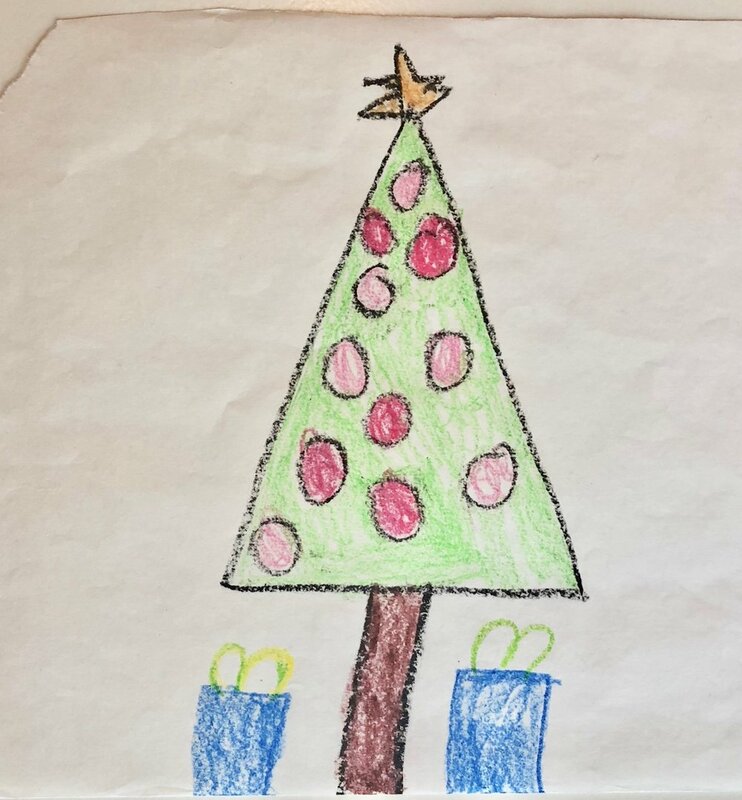 Your little ones will be so proud to hand out gifts with their drawings displayed as the star of the show. Another fun, easy way to make gift tags is to print out some favorite holiday sayings on card stock, in an elegant font and a beautiful color that fits your decor. The trick is to make them large. They will look beautiful and cost you next to nothing. I have just shown you a few below, but the sky is the limit here. Print the initials of the recipient, HO HO HO, No Peeking, HBJ: Happy Birthday Jesus, Every time a bell rings an angle gets his wings, MERRY MERRY, Merry and Bright, with love The Andersons…I could go on and on. These can be formal or informal. Just use your imagination and have fun! I know it seems we have less and less time to enjoy the holidays every year. Simple crafts like these won’t take a lot of time or cost a lot of money, but they will warm your heart and bring a smile to someone’s face. I hope you have a wonderful holiday season and are able to carve out bits of time to slow down and enjoy the reason for the season.